Art is not only a medium of self-expression, but also an important way to convey messages to the general public. Science and art are also not mutually exclusive. 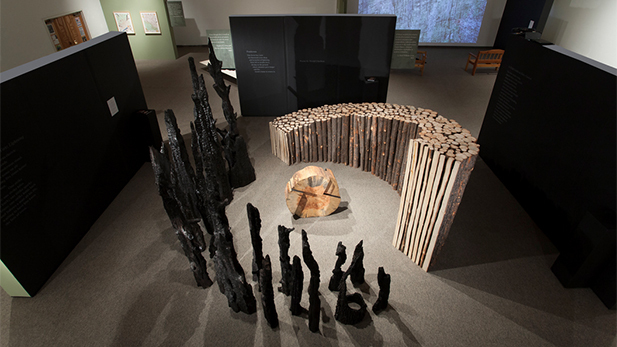 "Wildfire season has officially comes to a close, but it roars on at the University of Arizona Museum of Art's 'Fires of Change' exhibit, featuring the work of 11 artists. Before they started to work on their pieces, the artists spent a week with scientists learning about fires in the forests of Northern Arizona in what museum officials call a wildfire bootcamp." "Miller said the exhibition doesn’t dwell on the destructive force of fire. "But as a necessary part of the forest ecosystem that’s all part of the rejuvenation of the forest, and the more humans suppress fires, the more catastrophic they become," she said. The 11 artists worked across a range of mediums: installation, film, sculpture, even quilting."